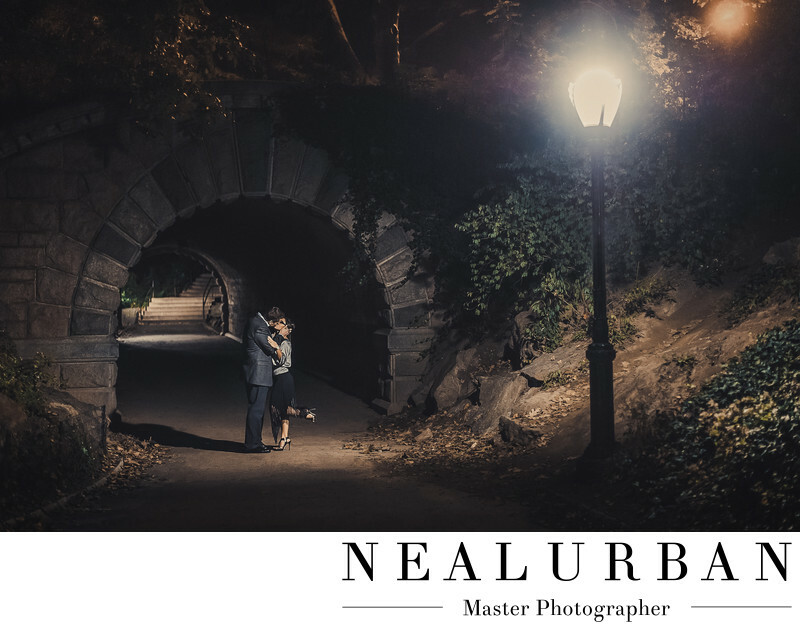 Leyla and Mike brought us to New York City, New York for their destination engagement session! It was one we will always remember. We would be there for two days. We planned out the areas they wanted to go to, to fit everything in! They really wanted to go to Central Park. Mike proposed there. Neal wondered if they would be up for going at night as well! We could give them two versions of the park. It was beautiful at night. Pretty quiet too! We walked around for a little while and took photos anywhere we thought would be awesome. Then we saw this tunnel! We loved the one lamp post! The light was pretty bright too! There was actually enough light creating a spot light on the couple. It also lit up some of the area around them. There is a really neat shadow casting too! We had Leyla and Mike go in for a kiss. The we had Leyla kick up her leg! Another cool part of this image is through the tunnel. There is another lamp post on the other side. It is lighting up park bench! We also did photos in Time Square, Waldorf Astoria, Tiffany on Fifth Ave, and the Flat Iron Building. It was amazing! Side note! The presidential election of Obama's first election was going on. There was some debate going on at the Waldorf where Leyla and Mike were staying. We were catching our flight out and left our bags in their room. We had to check out off ours. After we finished the shoot, we were already running late. All of the guests were arriving and we could not get out of the hotel to hail a cab. A giant secret service man was blocking the entrance and we asked him to help. He escorted us out of the hotel and got us a cab! We felt like celebrities! Location: Central Park New York City New York United States.